After watching the attacks on workers taking place across the country, it is time to stand up to the union busters in our own community. 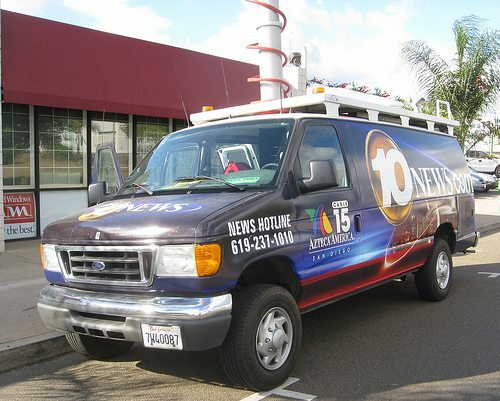 McGraw-Hill-owned KGTV Channel 10 refuses to negotiate a fair contract with employees for the fifth year. They have actively engaged in union-busting campaigns and employee intimidation. The Labor Council has held an advertising and consumer boycott of KGTV Channel 10 News for several years. Despite their drop in ratings and loss of ad revenue, KGTV has launched further attacks against the workers, represented by NABET CWA Local 54. While the boycott has been extremely successful, it is time to advance the campaign and take it to the next level. May is an important month for television ratings and we would like to take this opportunity to remind you to Turn Off 10! Please ask your family, friends, and neighbors to join you in supporting the members of Local 54 and urge them not to watch Channel 10 News. In addition to the ongoing consumer boycott, please refrain from appearing on or speaking to Channel 10 News during the month of May. To learn more about the campaign to Turn Off 10 and the union-busting activities of McGraw-Hill-owned KGTV Channel 10, visit www.10NewsUnfair.com . And if you are on Facebook, please “Like” our Turn Off 10 page and share with your friends to help spread the word. Your support for these workers and their right to a fair contract is invaluable. Thank you! Working families also celebrated the day with a rally at Civic Center Plaza in downtown San Diego. The “Turn Off 10News” campaign was one of the highlighted presentations: “You can still watch Dancing with the Stars and your other favorite television programs on Channel 10, but when the news comes on, please TURN OFF 10!” Union members reported that when a 10News crew was spotted in the crowd, people began chanting “10NewsUnfair.com” and “Turn Off 10News.” The crew eventually left. Last week, McGraw-Hill reported first quarter broadcasting revenue of $20.6 million, up 10.2% from the same quarter a year ago. But those positive results were in spite of KGTV. Before the results were released, KGTV Director of Operations Mike Biltucci said that 2011 was “not starting as anticipated,” revenue for the quarter was going to be either flat or down and that “expenses are being closely scrutinized.” Management sources indicated that McGraw-Hill’s Denver TV station was responsible for the increase. Local 54, The San Diego & Imperial Counties Labor Council and its 192,000 members and the California Labor Federation continue to boycott KGTV until management negotiates a fair contract with employees. Although I’m not in OB at this time this kind of action is right in my wheel house. The easier it is to make a difference, the better. All you guy’s (and gal’s) have to do is not watch the channel who hates it’s workers. And call out the bars on Newport,and your friends. When you are in a store with a t.v. put the channel on any other channel. This a no brainer. Any time you see the enemy logo, you “X” it out. this applies to all Rogue corporations. Such as those who refuse to take the “Oath”. (The “oath” is yet to be written). If Grover Norquist can do it with taxes, then we can do it with Social Security and Medicare. Take the “Oath” or suffer the consequences. Newer Article: May Day Rallies or May Day Follies in San Diego?